Harry Reid threw his support behind Paul Ryan for Speaker back in October. Ryan was elected Speaker of the House in October. 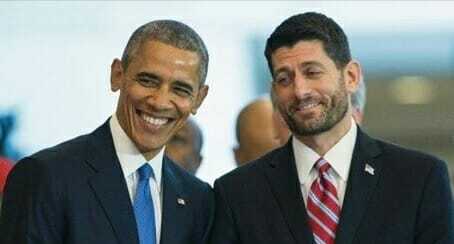 Last Thursday Speaker Ryan passed a trillion dollar budget deal that was widely praised by Barack Obama and Democratic leaders. They got everything they wanted. ** There is a movement to primary Paul Ryan out of Congress. This week Paul Ryan told his GOP colleagues that he has a new alliance with Harry Reid. House Speaker Paul Ryan (R-Wis.) informed his GOP colleagues at a recent closed-door meeting that he had just received a “promise” from Senate Democratic Leader Harry Reid. The room — filled with lawmakers skeptical of Reid’s motives — erupted in laughter. “I know, I know,” the rookie Speaker replied with a grin, according to lawmakers in the room. Fresh off a nearly $2 trillion government-funding and tax-cuts deal, both Ryan and Reid are sounding a rare note of cooperation in the midst of a highly partisan presidential election cycle. However, Reid’s pledge to return to regular order on appropriations bills is facing hearty skepticism from congressional Republicans. They feel they’ve been burned one too many times by Reid, who repeatedly filibustered House-passed appropriations bills this year and has a reputation for launching broadsides against the GOP from the Senate floor. And they’re not so sure the Nevada Democrat will allow bills to move through the Senate Appropriations Committee to the floor, where after they are approved they could be merged with House-passed legislation. “I personally don’t trust Harry Reid as far as I could throw him,” quipped Rep. John Carter (R-Texas), chairman of the Appropriations subcommittee on Homeland Security. “I’m extraordinarily skeptical,” added Ryan’s Wisconsin colleague, GOP Rep. Reid Ribble.